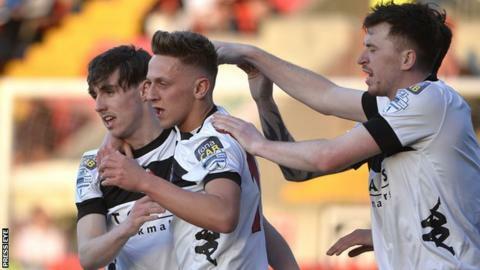 Crusaders have retained the Irish League title for the first time in their history as a 3-1 win over north Belfast rivals Cliftonville gave them an unassailable lead over Linfield. A first-half Gavin Whyte goal and two second-half strikes by Paul Heatley ensured a Crues victory at Solitude. Andrew Waterworth and substitute Aaron Burns found the net twice as Linfield trounced Glentoran 4-0 at the Oval. Glenavon defeated Coleraine 3-0 to move above Cliftonville into third place. Crusaders secured back-to-back Premiership successes by continuing their impressive run of form against the Reds, which has now seen them win six and draw one of the last seven meetings between the sides. The champions took control from the outset and Whyte smashed the ball past Peter Burke in the 10th minute after a poor clearance by the home goalkeeper. Before half-time, Burke tipped over a Jordan Forsythe piledriver, Jordan Owens flashed a right-foot effort wide and Heatley had a shot palmed away. After the break, Owens saw an effort cleared off the line, before Heatley extended the lead by firing home right-footed on 56 minutes after the ball took a couple of deflections inside the area. Heatley struck again two minutes later, then Burke denied the winger and Declan Caddell had an attempt cleared off the line by Levi Ives. George McMullan grabbed a consolation goal by drilling in with four minutes remaining but it was the Crues who sealed a sixth league championship triumph. Stephen Baxter's side have lost just three of the 36 league games they have played to date this season, including an opening day defeat to Portadown, their only home reverse of the campaign. Crusaders manager Stephen Baxter: "These are good players and good players win leagues. They have worked hard and fully deserve this success. "It's been difficult as everyone wants to beat you when you are champions so we had to dig out a few tough results and chip in with some late goals. "We looked dead and buried at times and we had a lot of hard, tough games in the second half of the season. We ground it out and came back stronger and stronger." Linfield proved too strong for the Glens but lie eight points behind the Seaview outfit with just two sets of fixtures remaining. Waterworth opened the scoring with a cool low shot past Elliott Morris into the bottom corner in the third minute and added another just after the half hour with a stunning right-foot strike into the top right-hand corner. Burns tapped in from a Mark Haughey assist on 82 and the midfielder netted again four minutes later to complete a convincing win. The result means the Windsor Park side have won three and drawn one of their four encounters against their cross-city rivals, while the Glens' run of five games unbeaten comes to an end. Coleraine's dismal run of form continued as a Neil McCafferty own goal after 20 minutes, a Simon Kelly header from an Andy Hall free-kick on 29 and a late Kevin Braniff free-kick into the top corner from the edge of the area moved them two points above Cliftonville in the battle for a Europa League place. The Bannsiders, who had Lyndon Kane sent-off with two minutes left, are now without a win in six games, while the Lurgan Blues have won all four meetings against Oran Kearney's side this season, without conceding a single goal. Coleraine have found the net just once in their last six league outings.